We're emphatically grateful to our fantastic guests that continue to support our restaurant with every lunch or dinner reservation and every vote for PIER 22 in contests like the Herald-Tribune's Reader's Choice Poll. We're more fortunate than most; at PIER 22 our guests are more than patrons you're part of the family, and we want you to feel at home whenever you dine with us. It is with great satisfaction and an incredible sense of duty that we accept 11 Reader's Choice awards in food and drink categories like Best Waterfront Dining, Best Brunch, Best Sushi and Most Romantic Restaurant. 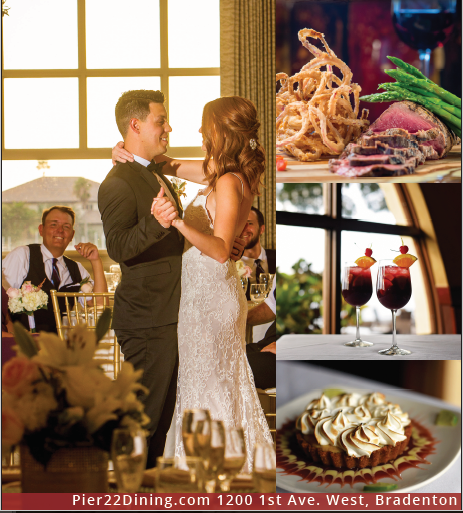 When you visit the PIER 22 restaurant, one of our private dining venues or any of our special-event spaces we hope that you'll find yourself in a place where Old-Florida still exists—a place where scratch-cooked meals and Southern hospitality are the foundation for all that is right with the world. Our success is built on a commitment to quality and service that just won't quit, and our goal is to curate only the best possible guest experiences. We thank you for the opportunity to keep earning your business, and we appreciate our fans for recognizing us as one of Manatee's best restaurants and caterers.